Regarded by many music-lovers as one of the world’s most beautiful concert halls, Severance Hall opened in 1931 as the home of The Cleveland Orchestra. The building is named for John L. Severance and his wife, Elisabeth, who initially pledged $1 million for its construction. Elisabeth died unexpectedly early in the design process, and John Severance made additional contributions toward the building in her memory. The building’s architectural significance has been recognized by local and national preservation societies, including the Cleveland Landmarks Commission and the National Register of Historic Places, and Severance Hall is a recipient of the Honor Award by the National Trust for Historic Preservation. A $36-million restoration and expansion of Severance Hall was completed in January 2000. The two-year Renovation Project was undertaken to restore the hall’s original detailing, expand its patron amenities and services, retain and enhance its legendary acoustics, and to update its performance and support spaces to once again provide a state-of-the-art home for the Orchestra. The highest goal of the project, designed by David M. Schwarz Architectural Services of Washington D.C., was the preservation of Severance Hall’s acclaimed beauty and architectural integrity. 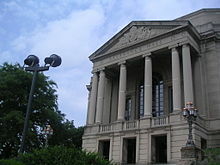 Severance Hall serves as the home of The Cleveland Orchestra for concerts, rehearsals, and administration. The building is also rented by a variety of local organizations and private citizens for performances, meetings, and gala events. The orchestra was founded in 1918 by Adella Prentiss Hughes, with Nikolai Sokoloff as its principal conductor. From early in its existence, it toured throughout the eastern United States, made radio broadcasts, and recorded many albums. Subsequent principal conductors, with the title of Music Director, were Artur Rodziński (1933–1943), Erich Leinsdorf (1943–1944), and George Szell (1946–1970). From 1964 to 1965, James Levine served as an apprentice to Szell with the Cleveland Orchestra, and then served as its assistant conductor until 1970. Subsequent Music Directors were Pierre Boulez (Musical Advisor 1970-1972), Lorin Maazel (1972–1982), and Christoph von Dohnányi (1984–2002). Franz Welser-Möst has been Music Director since 2002 and is contracted to remain through the 2021-2022 season. Szell’s long reign as Music Director has been largely credited for the orchestra’s rise to eminence. He reformed the orchestra in the late-1940s, firing a dozen musicians in the process with a dozen more leaving of their own volition. Szell is also credited with giving the orchestra its distinct, European sound. He pushed an ambitious recording schedule with the orchestra, bringing its music to millions worldwide. Szell’s influence has continued, even decades after his death. In addition to a vast catalog of recordings created with the ensemble’s music directors, the orchestra has made many recordings with guest conductors Vladimir Ashkenazy, Oliver Knussen, Kurt Sanderling, Yoel Levi, Riccardo Chailly, Michael Tilson Thomas, and Louis Lane(the orchestra’s longtime Associate Conductor). Past assistant conductors of the Cleveland Orchestra include Matthias Bamert, James Levine, Alan Gilbert, James Judd and Michael Stern. Severance Hall, the orchestra’s home since 1931. Severance Hall is the Cleveland Orchestra’s home. It was built for the orchestra in 1931. The orchestra performs the majority of its concerts at Severance and also uses the hall for rehearsals and to house their administrative offices. The concert organ there is by Ernest M. Skinner IV-94. During the summer months, the orchestra presents their annual Blossom Festival at the Blossom Music Center in Cuyahoga Falls, Ohio. Until 2005, the Blossom Festival had its own music director. The last person to serve in that capacity was Jahja Ling. After he stepped down from that position, the orchestra eliminated the post, and now has current music director Franz Welser-Möst in charge of the classical music concerts at the Blossom Festival.